The 16-year-old sat six points ahead of Armstrong heading into the final race of the season at Manfeild, and lined up second on the grid alongside ex-DTM driver Lucas Auer. Armstrong pulled alongside M2 Competition team-mate Lawson and the two ran side-by-side for a number of corners. Lawson was eventually forced wide, running onto the grass and dropping back to fourth. Another red flag period postponed Lawson’s recovery, but he was immediately on the attack when racing resumed. He ran three abreast with Esteban Muth and TRS veteran Brendon Leitch, sweeping past both to take second and reel in Armstrong. As he began to do so stewards issued Armstrong with a five-second time penalty for the earlier move. Armstrong took the chequered flag only 2.4s ahead of Lawson, meaning it was the latter who was promoted to first place, claiming both the coveted grand prix and TRS title as a rookie. “I was really nervous going into that race, as I’ve been wanting to do this [event] for a long time,” Lawson said. “I thought the race was over after Marcus ran me off the track. But I fought on, and he got a penalty for it. The win was Lawson’s fifth of the season, and reflected the closely-fought nature of the title fight between the pair. Lawson won the Highlands Motorsport Park season opener, but third-season driver Armstrong was more consistent at first, with a Lawson retirement at Hampton Downs swinging the title fight Armstrong’s way. 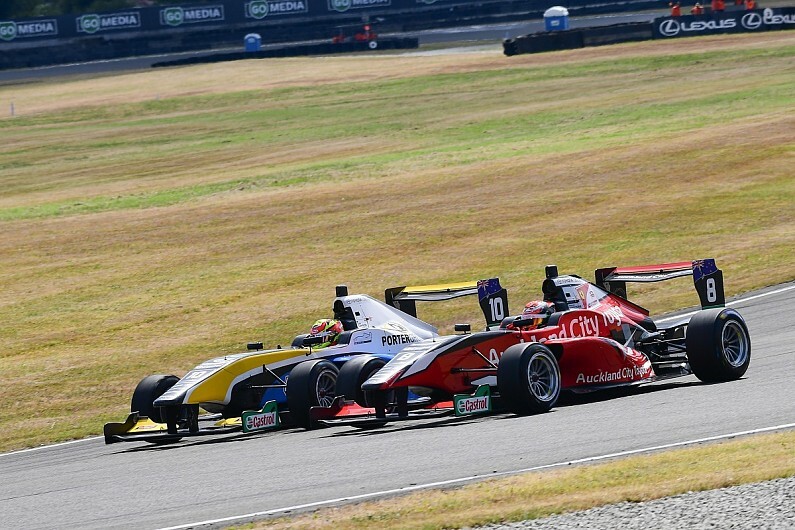 Bad luck struck Armstrong at the next round at Taupo, where new Red Bull junior Auer took his only win of the season. After Armstrong’s victory in race one at Manfeild, the pair were separated by just one point. The gap widened when Lawson won a wheel-to-wheel battle over fifth place with his title rival in race two, with Armstrong then being dropped back to ninth due to a penalty, pre-empting the second penalty that would cost him grand prix victory. Single-seater returnee Auer finished third in the standings, taking three poles on the way, but his GP was cut short when he was involved in a multi-car pile up. The high rate of attrition meant only eight drivers reached the chequered flag, with 77-year-old Kenny Smith, in his 46th New Zealand Grand Prix, rounding out the field.